Student delegates representing the G7 countries caucus at Webster Vienna's Model UN. 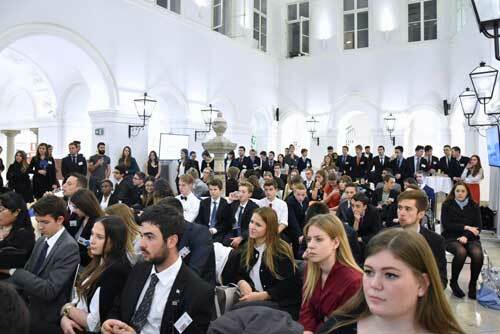 Delegations from over 45 countries comprising 130 student delegates focused on "The Geopolitics of Resource Scarcity" at this year's three-day Webster Model United Nations (WebMUN 2015) in the Palais Wenkheim at the Webster Vienna campus. The conference took place with substantial support by Webster’s International Relations Department, the Media Department and business students, and expanded on the success of last year's interconnectivity sessions. WebMUN 2015 helped improving academic research, public speaking, debating, critical thinking and teamwork, as well as leadership skills. The conference’s main goal was to give students a practical sense of how politics, diplomacy, international relations and the United Nations work. Webster Model United Nations in Vienna drew 130 student delegates representing 45 countries. WebMUN 2015 was opened by Julian Schuster, Webster's provost, senior vice president and chief operating officer, and keynote speaker Ambassador Hubert Heiss from the Austrian Ministry for European and Foreign Affairs. Present both at the opening and closing ceremonies were Webster Vienna director Bernd Marin and professor Franco Algieri, head of the International Relations Department. Dennis Heumann, this year’s WebMUN’s Secretary General, honored best delegates on the final day. Read the full story in this article at the Webster Vienna site. For an overview of the conference proceedings, see WebMUN’s official website at www.webmun.org. For more photos including a look at the behind-the-scenes interaction among delegates and academic departments, see the WebMUN15 photo albums on Facebook.